It closed in December, 1986, with a free buffet for 300 just prior to the demolition of the property, a landmark since the 1950s at 800 Queenston Road, across from what is now Eastgate Square. When the restaurant opened in 1957, a coffee and piece of homemade pie cost 49 cents. The often photographed mural on the restaurant’s back wall. Spec Archives. For migrating Americans who used southern Ontario as a short cut, “Gulliver’s was a handy resting stop, as it was for weary tourists, travelling salesmen and nervous newlyweds,” reporter Brian Christmas wrote in a Spec feature in December, 1986. The restaurant, with the mural painted by Alex Von Svoboda in 1956 – depicting Lilliputians dancing around Lemuel Gulliver’s feet. 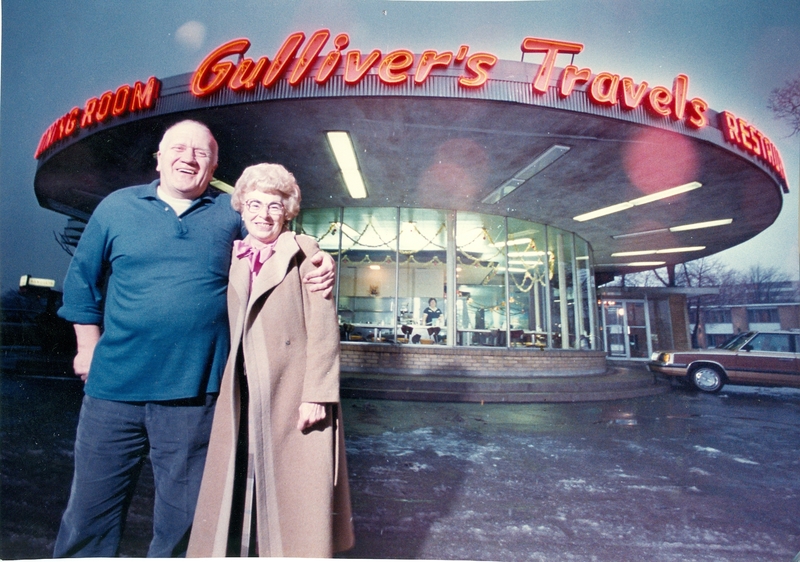 Gulliver’s travels was known for its old-fashioned lunch counter, original stainless steel pie case and sweeping picture windows. Ian Fraser and his wife Mary bought the 2.4-hectare (six acre) spread as an eight-unit country motel and cabins from Roy Gulliver – ending up with the bustling restaurant and 85 rooms.  Archived in Flashback and tagged Gulliver's Travels Motor Hotel, Hamilton Ontario. Bookmark the permalink. Can almost see Don Draper sitting in one of those seats. 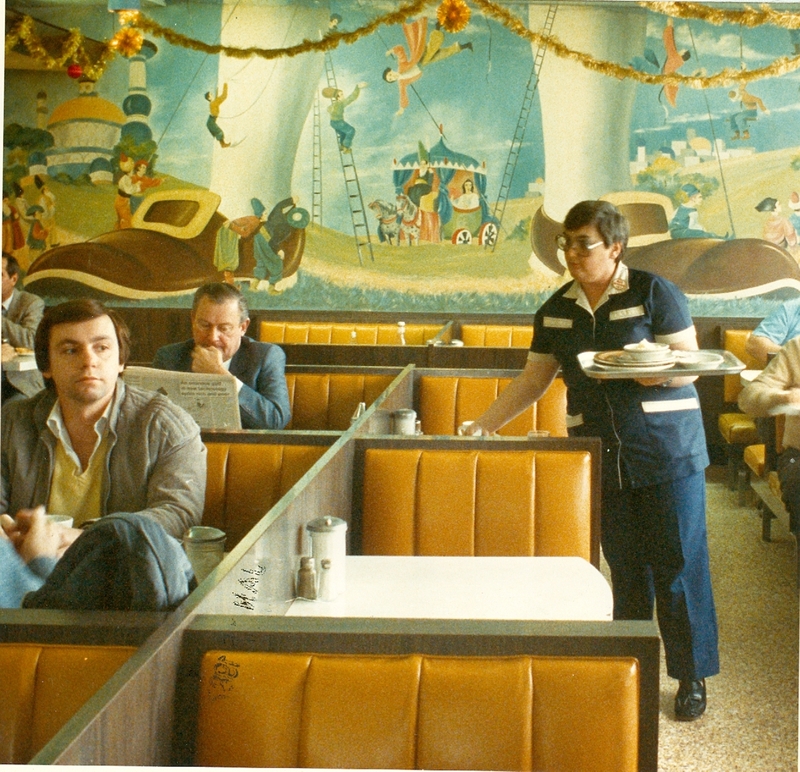 Wouldn’t it be fantastic to have some restauranteur build one just like it – again. Agreed Chelsea. They don’t make them like this any more. My uncle and aunt Wally and Helen Wallace ran and lived upstairs in the City Service gas station and resteraunt across from Gulivers Travells. It was a popular stop for Hamilton celebrities. Cozy little resteraunt and small 50’s style bar. My aunt used to give me the 78 records from the worlitzer juke box when they were finished with them. A lot of fond memories. My wife and I held our wedding reception their on March 21, 1970. Still together today so it worked out well as a starting point for us. Eating at this restaurant was always a treat as a child. My family lived out of town but when we travelled to Hamilton area, my sister and I always begged to stop and eat at ‘Gulliver’s’. We were never able to take our eyes off the mural! I remember you could get a great breakfast and good coffee there. The food was always good there and a great view with the expanse of windows. I really missed the place when they closed it. It truly was a Hamilton landmark. 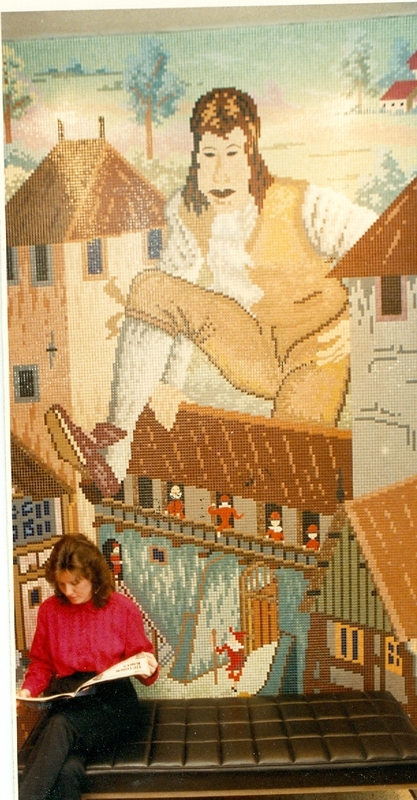 i grew up just down the road from Gulliver’s. We would go there as a family on occasion to eat. I remember the hotel area. My best memory was on December 21, 1987. I had been dropped off by a co-worker here to wait for a ride home. (no busses to Satellite City in those days). At the time, I was 8 months pregnant. I walked into the lobby area, went to the washroom and came up stairs and said to the staff. I’m pregnant and my water just broke. The staff was helpful by asking anything they could do. They kept me positive and cool until my ride arrived, which took me to the hospital. I’ll never the place for its circular look with the hotel on the side, friendly staff and the help they gave me that night. My wife and I ate there a few times, a wonderful place with good food. Too bad it is gone. Hamilton has a practice allowing landmarks to be destroyed. I have some of the memorabilia they gave away when they were getting ready to demolish the building. So sad the City was so short sighted. My mom actually worked there, so we spent many nights there for supper. 🙂 I often wished they would bring it, and the Millionaire back. We would head to the lounge there after work at a part time job (10 or 11 pm on a weekend) for a couple of drinks. Young fellas, you know, it made us feel ‘all grown up’. That is till one night, dad must have caught wind of our haunt, he showed up, saw me at one of the tables, didn’t say a word….pointed out the door while glaring at me. He then leaned over the to the barkeep and in one fell swoop, ended our after work get together’s. That lounge had such a nostalgic 50’s feel to it. I loved the place. OMG!!! My Boyfriend (now my husband) and I use to go here late on Friday or Saturday night any a night of dancing and drinking. Always a cup of coffee and a piece of pie. Why are there not places like this anymore. One of the most wonderful places to eat and hang out. Miss it and we often with this would come back. Yes Hamilton is great at tearing down great landmarks! My mother (Corry) also worked there for years. Loved going there with my dad waiting to pick my mother up after her shift. Mr. and Mrs. Fraser were always friendly and treated my mother well. Thanks for posting. Brought back some nice memories. When my family went travelling, my dad would always say” let’s stop at Gullivers” – then we would know we would be home in 45 minutes. (Dunnville). He also loved the home made pies and I think that was the real reason we stopped at the restaurant! I still drive by the area and think about the old days! After my family moved to the east end in 1973 a whole new world opened up. My friend Pat and I would often go there for coffee, especially at Christmas. 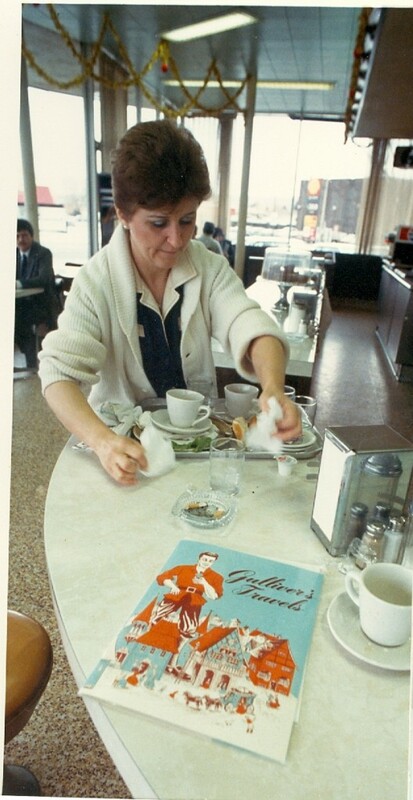 There were no 24-hour doughnut or coffee shops back then, but Gullivers was always opened. Excellent coffee, excellent staff…oh the memories. So many of the old places are gone now. Gullivers was truly a landmark. Billy Sunday washed dishes for years at Gulliver’s, he was known for riding his bicycle from Grimsby to Gulliver’s everyday to work. This is also where they held The Sport & Fitness Academy Christmas Parties! Oh the memories, I worked there 7 years until I finished college and left. IMy sister and I both were waitress in the coffee shop and often served at the banquets. My brother was a bar tender in the Lilipution Lounge. It was a great place to work and the Frasers were lovely people that treated us like family. I pretty much grew up there! I remember your mom. She worked in the dining room. We always had nice chats. My last name back then was duff. I worked for 13 yes from age 12. Yep dated Brian Fraser too for many years. Wonderful memories. I worked there one year while in high school making $2.65 an hour doing outside maintenance, bell hop, general gopher, etc. Mr. & Mrs. Fraser were very nice people to work for. The original unused office and reception area was in the older west side building that was also the older single story motel. It had furniture that seemed to be from the 50’s or 60’s. Dark curtains making it totally dark in there even in the day time. Well let me say I looked forward to the following monthly meetings and tried to make sure I was scheduled to work those nights as I was always given a $10 tip. It was a few years later when I finally figured out who these “business men” were. Lets just say that they have been in the local news several times over the years, and have had books written about them. I know Count Alex von Svoboda who designed Gullivers and all the art work plus innumerable other works.. Still living. In Barrie in the summer and in Florida in winter. http://www.alexvonsvoboda.com/About.html …What the write up doesn’t tell is of him as a teenager being grabbed by the Nazis when they invaded Austria and being sent to the Russian front to fly Messerschmits against the Allies. He escaped and got across war torn Europe and landed up with the Allies and became General Paton’s interpreter. Thanks – that’s amazing. Wonderful to know! How wonderful to see this tribute to Gullivers. My Aunt Mary and Uncle Fritz (Ian) provided me with summer employment in the 50s. I came from Toronto and spent my summers there. What wonderful memories I have of that time and especially remember my 15th birthday party. Although Uncle Fritz passed away a few years ago, Aunt Mary remains active and is a wonderful person to enjoy time with. I too remember how warm and friendly they were with customers and staff alike. We now live in Stoney Creek, and I cannot drive by the corner of Hwy. 8 & Hwy. 20 without recalling memories (although it sure doesnt look the same anymore. Thank you for the very nice comments. I too miss the hustle and bustle of Gulliver’s. If we could only turn back the clock. We had wonderful staff and great customers, and I’m left with fond memories. What a wonderful tribute to Gulliver’s and Mom & Dad. There was never a dull moment growing up living right on the premises. We had some great people that worked with us and yes they were like family. My brother Brian and myself still live in Stoney Creek. I appreciate all your comments. Thank you for sharing. Loved working there with your family, 85 cents to start back in 1966 then 90 cents when I went back to school. So many fun times bugging the waitresses. Loved our friendship in the band and over the years. God Bless ! Your Dad and Mom were the absolute BEST people to work for !!!!!!! My fondest memories growing up in Stoney Creek were the summer days when Gulliver Travels used to rent the front lawn out to the kennel club for the dog shows. I can remember driving up to the restaurant for lunch with my sister and Mom. The classes would be in full swing and we would beg our Mom to take us down to see the dogs and if we were really lucky, get to pat a few. This would be followed up by a delicious lunch and then back home again. I remember when they tore the place down. It was so sad!!!! Some people feel that bigger and newer is better but there is no replacing the history and nostalgia that comes with a place as special as Gulliver’s Travels. The place is gone but now the memories will be with me always. We spent our first night at Gulliver’s Travels when we got married, Oct.20th. 1956. So sad when this was taken down.